Flowering Season: Spring, Summer (late), Fall. Description: The small flower heads are mostly borne singly and usually have 4 to 9 rays (petals) and 10 to 12 disk florets. The basal leaves are absent at flowering, and the sparse stem leaves are green, 1-veined, and linear to threadlike in shape. 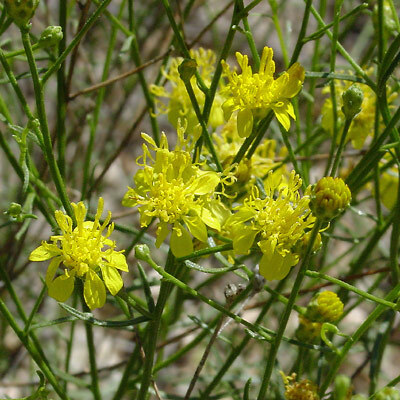 The stems are green, wiry, and glabrous (hairless). 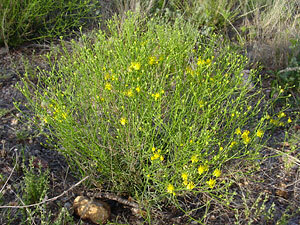 The similar Broom Snakeweed (Gutierrezia sarothrae) is also found in the desert, but it is a larger plant and has minutely hairy stems. Other similar Gutierrezia species are only found at higher elevations (in upland areas and in the mountains).